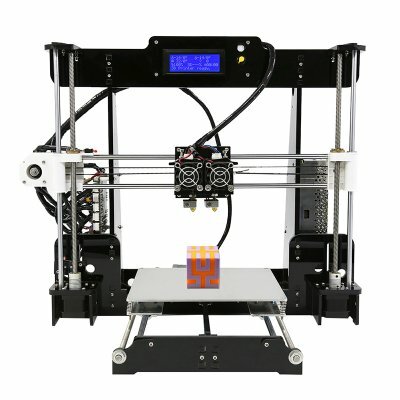 Successfully Added Anet A8 M DIY 3D Printer Kit - Dual Nozzles, Online & Offline Printing, 40-120mm/s Print Speed, High Precision to your Shopping Cart. Supports a wide range of filaments including ABS/PLA/TPU/PVA and PP. The Anet A8-M is a dual extruder DIY 3D Printer kit. This is an upgraded version of the Anet A8 i3 and as well as having dual extrusion nozzles it supports a good range of filaments such as BS/PLA/TPU/PVA and PP. You can achieve great detailed print quality with the 0.1mm printing layers and have the ability to print in different mediums as well as colors. This 3D printer comes with a DIY Kit that is a perfect way to learn about 3D printing and have fun building a rewarding project that can later be used to craft components and modules for other builds. Once assembled you will be able to print objects up to 220x220x240mm in volume. You can use this 3D printer to create from your computer and it works with both Mac and Winwos OS systems which allow you to print and design though supported software such as Repetire-Host. Alternatively, you can print your design files directly from a micro SD card and there are a number of supported design file formats. The precision motors and build allow for a printing precision of 0.1mm and 0.02mm which results in highly detailed replications of your designs. This is great for modelers and hobbyists who want to engineer their own products or make finely detailed and realist scale models. So whether you're printing your own unique creations or using one of the thousands of freely available 3D printing designs your guaranteed to get stunning results. The Anet A8-M dual extruder 3D printer is an excellent purchase for tech-geeks, hobbyists, artists, engineers or designers and offers a unique learning experience for classrooms and universities as you can bring fun into education by working on this DIY project with your students. The Anet A8-M DIY 3D Printer kit comes with a 12 months warranty, brought to you by the leader in electronic devices as well as wholesale 3D printers and other cool gadgets..